Perhaps the single most critical decision in the development of a mining project is the determination of the size of the operation. How big will the mine and mill be? What will be the daily and annual throughput? All of the major elements of the project hinge on this decision: the capital cost, the operating cost and the life of the mine. It is a daunting task. Hugh Taylor was a mining engineer working for Placer Development Limited in Vancouver in 1976 when he presented his “law” in a paper at a mining seminar in Spokane, Washington. Taylor had observed that using economic theory and net present value methods tended to result in “optimum” mining rates that were impractically high and unachievable in practice. This was particularly true for inexperienced companies. Taylor developed his equation from the observation of some 30 mining projects which encompassed a wide range of mine types. It was an empirical approach or rule-of-thumb rather than theoretically derived. It should be pointed out that Taylor himself noted a number of situations where his equation did not work well, including old mines in the late stages of operation; very deep, flat ore bodies where production is limited by hoisting limits of the shaft; and erratically mineralized systems. Over the intervening years, a number of people studied and tested Taylor’s work and even developed several other equations that, while they may do a better job in specific circumstances, require more variables, including capital and grade, to obtain results. In 1995, I began a correspondence with Taylor when he wrote a critique of a paper I had published in the CIM Bulletin. I was quite surprised to have the man who developed Taylor’s Law engage in a discussion of my work. We met in person at a CIM convention shortly after and began a friendship that lasted over 20 years. Hugh Taylor passed away in Vancouver on May 15, 2015 at the age of 98. He was a CIM Fellow, CIM Life Member and recipient of the Robert Elver mineral economics award in 1982. He was very active in CIM, serving on the Vancouver Branch and District Six committees in the 1970s, as well as being the London IMM’s Overseas Member of Council for Canada in the 1980s. He wrote and presented a number of papers that covered most aspects of practical mining economics, generally as seen from the operating perspective of the production man that, at heart, he had always remained. Taylor was born in London in 1916 and after graduating from the Royal School of Mines, University of London in 1937, he immigrated to southern Africa where he spent the next thirty years working on the Witwatersrand and other areas of the Transvaal and the copper mines of Northern Rhodesia/Zambia. In 1967 he brought his family to Vancouver, where he remained for the rest of his life. For the next 14 years, he served Placer Development Limited as mine valuation superintendent. He retired officially in 1981, but continued working as a consultant until 1989 and as a technical author until 1995. Taylor’s Law has stood the test of time as the quickest and easiest way to determine a starting point in the estimation of mine life and the production rate for preliminary mine design. This is due to its simplicity of calculation and the fact that it was developed using real world data. Hugh was a kind and thoughtful man, a true English gentleman. And he was always a little surprised by the acclaim his “law” had received. For a full description of Taylor's Law, visit MineWiki, Queen's University's mine design project wiki page. 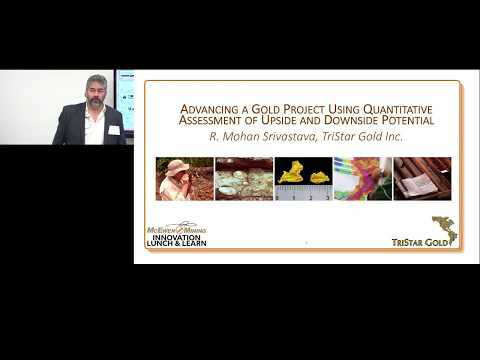 "The mining industry likes to speak with certainty, " says Mohan Srivastava, VP of TriStar Gold, and when it comes to resource reporting that means what is stated is almost certainly wrong. The geostatistician proposes another way of imagining a gold project.